The Ivernia leaves Marseilles bound for Alexandria. 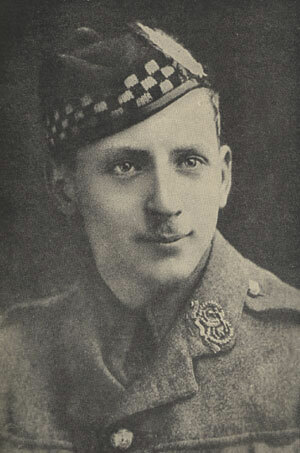 Captain John Currie Lauder (Argyll & Sutherland Highlanders) is killed at age 25. He is the son of ‘Sir’ Harry Lauder a popular composer and entertainer throughout the English-speaking world and Dame Lauder. His fiancée will die unmarried in 1975 and leave 50,000 pounds to Erskine Hospital “to provide some amenity for the hospital in memory of my late fiancée”. His father will compose a poem entitled “To the Memory of My Beloved Son Captain John Lauder”. But another side of Captain Lauder seems to have existed. He is seen by his men as a haughty disciplinarian, a stickler for rules and is intensely disliked by his men. It has been reported that he was actually killed by his own men. Captain Charles Robert Forbes Hay-Webb (Royal Field Artillery) is killed in action at age 22. His brother was killed in August 1915. Sergeant Christopher Howlett (Suffolk Regiment) dies of wounds at age 22. His brother died of wounds in October of this year. Private John Smith Parish (Bedfordshire Regiment) dies of wounds received in action at age 29. He is the son of Alfred Parish, the Salvation Army bandmaster. Private George Frederick Cook (East Kent Regiment) dies of fever at age 19. His brother will be killed in February next year.